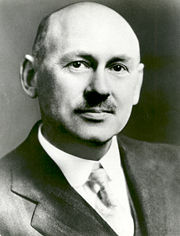 Robert Hutchings Goddard, Ph.D. (October 5, 1882 – August 10, 1945) was an American scientist and inventor who foresaw the possibility of space travel and launched the world's first liquid-fueled rocket. He also contributed to the development of the vacuum tube and to electromagnetic theory. Robert Goddard was born in Worcester, Massachusetts, the only child of Nahum Danford Goddard and Fannie Louise Hoyt. As the age of electric power began to take shape in U.S. cities in the 1880s, the young Goddard became interested in science. When Goddard was five, his father showed him how to generate static electricity on the family's carpet. The young Goddard experimented, believing he could jump higher if the zinc in batteries could somehow be charged with static electricity. The experiments failed, but his imagination would continue undiminished. Goddard developed a fascination with flight, first with kites and then with balloons. He also became a thorough diarist and documenter of his own work, a skill that would greatly benefit his later career. These interests merged at age 16, when Goddard attempted to construct a balloon made with aluminum, shaping the raw metal in his home workshop. After nearly five weeks of methodical, documented efforts, he finally abandoned the project. However, the lesson of this failure did not restrain Goddard's growing determination and confidence in his work. He became interested in space when he read H.G. Wells's science fiction classic The War of the Worlds when he was 16 years old. His dedication to pursuing rocketry became fixed on October 19, 1899. While climbing a cherry tree to cut off dead limbs, he imagined, as he later wrote, "how wonderful it would be to make some device which had even the possibility of ascending to Mars, and how it would look on a small scale, if sent up from the meadow at my feet." For the rest of his life he observed October 19 as "Anniversary Day," a private commemoration of the day of his greatest inspiration. A thin and frail boy, almost always in fragile health from stomach problems, Goddard fell two years behind his school classmates. He became a voracious reader, regularly visiting the local public library to borrow books on the physical sciences. Later, he continued his formal schooling as an 18-year-old sophomore at South High School in Worcester. His peers twice elected him class president. At his graduation ceremony in 1904, he gave his class oration as valedictorian. In his speech, Goddard included a phrase that would become emblematic of his life: "It has often proved true that the dream of yesterday is the hope of today, and the reality of tomorrow." Goddard enrolled at Worcester Polytechnic Institute in 1904. He quickly impressed the head of the physics department, A. Wilmer Duff, with his appetite for knowledge. Professor Duff took him on as a laboratory assistant and tutor. As a college freshman, he wrote a paper detailing a plan to link Boston and New York by a virtually frictionless magnetic rail line that would allow a journey between the two cities to be completed in ten minutes. His social activities continued at Worcester. He joined the Sigma Alpha Epsilon fraternity, and began a long courtship with Miriam Olmstead, an honor student who was second in his high school class. Eventually, she and Goddard were engaged, but they drifted apart and the engagement ended around 1909. While still an undergraduate, Goddard wrote a paper proposing a method for “balancing aeroplanes,” and submitted the idea to Scientific American, which published the paper in 1907. Goddard later wrote in his diaries that he believed his paper was the first proposal of a way to stabilize aircraft in flight. His proposal came around the same time as other scientists were making breakthroughs in developing functional gyroscopes. Goddard received his B.S. degree in physics from Worcester Polytechnic Institute in 1908, and then enrolled at Clark University in the fall of that year. His first experiments with rocketry are said to have begun around this time. These experiments attracted the attention of university officials after the academic community there was exposed to the acrid odor of burning rocket fuel, leading to a temporary suspension of Goddard's efforts. His first writing on the possibility of a liquid-fueled rocket came in February 1909. Goddard had begun to study ways of increasing a rocket’s energy efficiency using methods alternative to conventional, solid fuel rockets. He wrote in his journal about an idea of using liquid hydrogen as a fuel with liquid oxygen as the oxidizer. He believed a 50 percent efficiency could be achieved with liquid fuel, an efficiency much greater than that of conventional rockets. Goddard received his M.A. degree from Clark University in 1910, and then completed his Ph.D. at Clark in 1911. He stayed for another year at Clark University as an honorary fellow in physics; in 1912, he accepted a research fellowship at Princeton University. In the decades around 1900, radio was a new technology, a fertile field for exploration and innovation. In 1911, while working at Clark University in Worcester, Mass., Goddard investigated the effects of radio waves on insulators. In order to generate radio-frequency power, he invented a vacuum tube that operated like a cathode-ray tube. U.S. Patent No. 1,159,209 was issued on November 2, 1915. This was the first use of a vacuum tube to amplify a signal, preceding even Lee de Forest's claim. It thus marked the beginning of the electronic age. On the theoretical level, Goddard was able to demonstrate for the first time the mechanical effect of the "displacement current" predicted by James Clerk Maxwell that gives rise to radio waves. In early 1913, Goddard became seriously ill with tuberculosis, and he was forced to leave his position at Princeton. He returned to Worcester, where he began a prolonged process of recovery. It was during this recuperative period that Goddard began to produce his most important work. In 1914, his first two landmark patents were accepted and registered with the U.S. Patent Office. The first, Patent No. 1,102,653, issued July 7, 1914, described a multi-stage rocket. The second, Patent No. 1,103,503, issued July 14, 1914, described a rocket fueled with gasoline and liquid nitrous oxide. The two patents would become important milestones in the history of rocketry. Goddard's critical breakthrough in rocketry was to use as a rocket engine the steam turbine nozzle that had been invented by the Swedish inventor Carl Gustaf Patrik de Laval (1845-1913). The de Laval nozzle allows the most efficient ("isentropic") conversion of the energy of hot gases into forward motion. By means of this nozzle, Goddard increased the efficiency of his rocket engines from 2 percent to 64 percent. This greatly reduced the amount of rocket fuel required to lift a given mass and thus made interplanetary travel practical. Details of the de Laval turbine are available at the Steam Engine Library:  and Britannica. In the fall of 1914, Goddard's health had improved enough for him to accept a part-time teaching position at Clark University. By 1916, the cost of his rocket research was becoming too much for his modest teaching salary to bear. He began to solicit financial assistance from outside sponsors, beginning with the Smithsonian Institution, which agreed to a five-year grant totaling $5,000. Worcester Polytechnic Institute allowed him to use their Magnetics Laboratory on the edge of campus during this time. In 1919, the Smithsonian Institution published Goddard's groundbreaking work, A Method of Reaching Extreme Altitudes. The book describes Goddard's mathematical theories of rocket flight, his research in solid-fuel and liquid-fuel rockets, and the possibilities he saw of exploring the earth and beyond. Along with Konstantin Tsiolkovsky's earlier work, The Exploration of Cosmic Space by Means of Reaction Devices (1903), Goddard's book is regarded as one of the pioneering works of the science of rocketry, and is believed to have influenced the work of German pioneers Hermann Oberth and Wernher von Braun. Though most of this work concerns the theoretical and experimental relations between propellant, rocket mass, thrust and velocity, a final section (54-57) titled Calculation of minimum mass required to raise one pound to an "infinite" altitude discussed the possible uses of rockets, not only to reach the upper atmosphere, but to escape from Earth's gravitation altogether. Included as a thought-experiment is the idea of launching a rocket to the moon and igniting a mass of flash powder on its surface, so as to be visible through a telescope. The matter is discussed seriously, down to an estimate of the amount of powder required; Goddard's conclusion was that a rocket with starting mass of 3.21 tons could produce a flash "just visible" from the Earth. Forty years later, Goddard's concept was vindicated when the Soviet space probe Luna 2 impacted the Moon on September 14, 1959, though radio tracking did away with the need for flash powder. The publication of Goddard's document gained him national attention from U.S. newspapers. Although Goddard's discussion of targeting the moon was only a small part of the work as a whole, and intended as an illustration of possibilities rather than a declaration of Goddard's intent, the papers sensationalized Goddard's ideas to the point of misrepresentation. As a result of this, Goddard became increasingly suspicious of others and often worked alone, which limited the ripple effect from his work. His unsociability was a result of the harsh criticism that he received from the media and from other scientists, who doubted the viability of rocket travel in space. After one of his experiments in 1929, a local Worcester newspaper carried the mocking headline "Moon rocket misses target by 238,799 1/2 miles." Forty nine years afterwards, on July 17, 1969, the day after the launch of Apollo 11,  the New York Times published a short item under the headline "A Correction," summarizing its 1920 editorial mocking Goddard, and concluding: "Further investigation and experimentation have confirmed the findings of Isaac Newton in the 17th century and it is now definitely established that a rocket can function in a vacuum as well as in an atmosphere. The Times regrets the error." 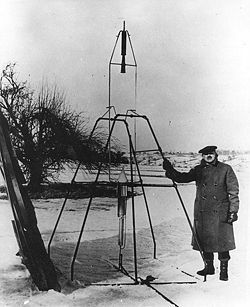 Robert Goddard, bundled against the cold New England weather of March 16, 1926, holds the launching frame of his most notable invention — the first liquid-fueled rocket. The rocket, which was dubbed "Nell," rose just 41 feet during a 2.5-second flight that ended in a cabbage field, but it was an important demonstration that liquid-fuel propellants were possible. Viewers familiar with more modern rocket designs may find it difficult, on viewing the well-known picture of "Nell," to distinguish the rocket from its launching apparatus. The complete rocket is significantly taller than Goddard, but does not include the pyramidal support structure which he grasps. The rocket's combustion chamber is the small cylinder at the top; the nozzle is visible beneath it. The fuel tank, which is also part of the rocket, is the larger cylinder opposite Goddard's torso. The fuel tank is directly beneath the nozzle, and is protected from the motor's exhaust by an asbestos cone. Asbestos-wrapped aluminum tubes connect the motor to the tanks, providing both support and fuel transport. Improved understanding of rocket dynamics, and the availability of more sophisticated control systems, rendered this design (in which a motor at the top pulls the rocket) obsolete, supplanted by the now familiar design in which the motor is located at the bottom and pushes the rocket from behind. After a launch of one of Goddard's rockets in July 1929 again gained the attention of the newspapers, Charles Lindbergh learned of his work. At the time, Lindbergh had begun to wonder what would become of aviation in the distant future, and had settled on rocket flight as a probable next step. He contacted Goddard in November 1929. The professor met the aviator soon after in Goddard's office at Clark University. Upon meeting Goddard, Lindbergh was immediately impressed by his research, and Goddard was similarly impressed by the flier's interest. He discussed his work openly with Lindbergh, finding a mutual alliance with Lindbergh that was to last for the rest of his life. By late 1929, Goddard had been attracting additional notoriety with each rocket launch. He was finding it increasingly difficult to conduct his research without unwanted distractions. Lindbergh discussed finding additional financing for Goddard's work, and put his famous name to work for Goddard. Into 1930, Lindbergh made several proposals to industry and private investors for funding, which proved all but impossible to find following the recent U.S. stock market crash in October 1929. Lindbergh finally found an ally in the Guggenheim family. Financier Daniel Guggenheim agreed to fund Goddard's research over the next four years for a total of $100,000. The Guggenheim family, especially Harry Guggenheim, would continue to support Goddard's work in the years to follow. 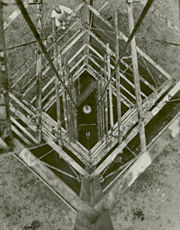 Charles Lindbergh took this picture of Robert H. Goddard's rocket, as he peered down the launching tower on Sept. 23, 1935, in Roswell, New Mexico. With new financial backing, Goddard was able to give up his teaching duties at Clark and relocate to Roswell, New Mexico (long before the area became the center of the UFO craze) where he worked in near isolation for a dozen years, and where a high school was later named after him. Though he brought his work in rocketry to the attention of the United States Army, he was rebuffed, as the Army largely failed to grasp the military application of rockets. Ironically, Wernher von Braun, working for the Nazis in Germany, took Goddard's plans from various journals and incorporated them into the design of the A4 and V-2 rockets that carried explosive payloads to European targets in the last two years of World War II. In 1963, von Braun, reflecting on the history of rocketry, said of Goddard: "His rockets … may have been rather crude by present-day standards, but they blazed the trail and incorporated many features used in our most modern rockets and space vehicles." The Germans were able to conduct research on rocketry because it was not included in the ban on armaments development in the treaty that ended World War I.
Goddard was the center of a famous espionage operation involving the German Intelligence Agency, Abwehr and an operative called Nikolaus Ritter. As the head of the agency's U.S. operations, Ritter recruited a source who infiltrated the circle around Goddard, leaking his discoveries to the Germans. Goddard was nonetheless extremely secretive. In August of 1936, he was visited by Frank Malina, who was then studying rocketry at the California Institute of Technology. Goddard declined to discuss any of his research, other than that which had already been published in Liquid-Propellant Rocket Development. This deeply troubled Theodore von Kármán, who was at that time Malina's mentor. Later, von Kármán wrote, "Naturally we at Cal Tech wanted as much information as we could get from Goddard for our mutual benefit. But Goddard believed in secrecy.... The trouble with secrecy is that one can easily go in the wrong direction and never know it." By 1939, von Kármán's Guggenheim Aeronautical Laboratory at Cal Tech had received Army Air Corps funding to develop rockets to assist in aircraft take-off. Goddard learned of this in 1940, and openly expressed his displeasure. After his offer to develop rockets for the Army was declined, Goddard temporarily gave up his preferred field to work on experimental aircraft for the U.S. Navy. After the war ended, Goddard was able to inspect captured German V-2s. While the conventional wisdom was that the German missile program depended on the achievements of Goddard, it also appears that the V-2s were build based on technology the German's had developed independently. Bronze plaque in Auburn, Massachusetts marking the spot where Dr. Robert Goddard launched the first liquid-fueled rocket on March 16, 1926. Goddard was awarded 214 patents for his work, 83 of which came during his lifetime. He was the first to launch a rocket that achieved supersonic speeds, and the first to use gyroscopes to stabilize rocket flight. Goddard was a unique individual who was clearly ahead of his time. In spite of the mockery he endured from the media, he continued his pursuit of rocket science, finally achieving substantial results. Because Goddard's achievements were overshadowed by the Germany's development of the V-1 and V-2 missiles during World War II, much of his legacy remains inspirational. While it is said that the Germans incorporated some of his innovations into their missile program, the V-2 superceded Goddard's own work, and formed the practical basis for the foundation of the American space program. The Goddard Space Flight Center, established in 1959, is named in Goddard's honor. Goddard crater, on the Moon, is also named in his honor. His home town of Worcester established the Goddard School of Science and Technology, an elementary school, in 1992. The Dr. Robert H. Goddard Collection and the Robert Goddard Exhibition Room are housed in the Archives and Special Collections area of Clark University's Robert H. Goddard Library, named in his honor. Outside the library lies a structure depicting the flight path of Goddard's first liquid fuel rocket. The Chemical Engineering department at Worcester Polytechnic Institute is housed in Goddard Hall, which is named in his honor. In 1967 Robert H. Goddard High School (9-12) was built in Roswell, New Mexico. The school's team name is appropriately titled "Rockets." The Robert H. Goddard Middle School (grades 6-8) is located in Glendora, CA. The school's mascot is the Titan IIIC missile. There is also a Goddard Middle School located in Littleton, Colorado. Their nickname is the Vikings. Still another, Robert Goddard Middle School, is located in Prince Georges County, Maryland. The Civil Air Patrol Cadet Program promotion to Cadet Chief Master Sergeant is named after Goddard. ↑ Robert Goddard and His Rockets. NASA. Retrieved October 8, 2007. ↑ Robert Hutchings Goddard. 2000. Rockets. (New York: Dover Publications. ISBN 0486425371), 145. ↑ Robert H. Goddard, 1914. On ponderomotive force upon a dielectric which carries a displacement current in a magnetic field. Physical Review 6(2):99-120. ↑ Gil McElroy, 1997. The Collins 45A - How Art Collins met Robert Goddard. QST 81(2): 44-46. ↑ David A. Clary. 2003. Rocket Man: Robert H. Goddard and the Birth of the Space Age. (New York, NY: Hyperion. ISBN 0786887052). ↑ Steam Engine Library  Illustration. Retrieved April 18, 2008. ↑ "de Laval turbine" 1999 illustration. Britannica.com. Retrieved April 18, 2008. ↑ 1920. Believes Rocket Can Reach Moon. Smithsonian Institution Tells of Prof. Goddard's Invention to Explore Upper Air. Multiple-Charge System. Instruments Could Go Up 200 Miles, and Bigger Rocket Might Land on Satellite. New York Times. ↑ 15.0 15.1 1920. Peter Alway Topics of the Times. New York Times. Retrieved October 8, 2007. ↑ "Robert Goddard and his Rockets." NASA . Retrieved October 8, 2007. ↑ Goddard, Robert (1882-1945). Wolfram Research. Retrieved October 8, 2007. ↑ W.S. Ross. 1967. The last hero: Charles A Lindbergh. (New York: Kessinger reprint. ISBN 1419138111), 246. ↑ Burrows, William E. 1999. This New Ocean: The Story of the First Space Age. New York, NY: Modern Library (Random House). ISBN 0375754857. ↑ 1945. Dr. Goddard Dead. Expert on Rockets. Pioneer in Field, Chief of Navy Research on Jet-Propelled Planes, Taught Physics Experimented Three Decades Secret Work During War. New York Times. ↑ George M. Siouris. 2004. Missile guidance and control systems. (New York: Springer. ISBN 0387218165), 2. Burrows, William E. 1999. This New Ocean: The Story of the First Space Age. New York, NY: Modern Library/Random House. ISBN 0375754857. Clary, David A. 2003. Rocket Man: Robert H. Goddard and the Birth of the Space Age. New York, NY: Hyperion. ISBN 0786887052. Goddard, Robert H. 2002. Rockets. Mineola, NY: Dover Publications. ISBN 0486425371. All links retrieved December 18, 2013. Biography resources dedicated to Robert Goddard. Robert Goddard Wing of the Roswell Museum. Dr. Robert H. Goddard Archives from Clark University. TIME 100: The Most Important People of the Century (March 29, 1999). "Robert Goddard". History of "Robert H. Goddard"
This page was last modified on 18 December 2013, at 16:10.